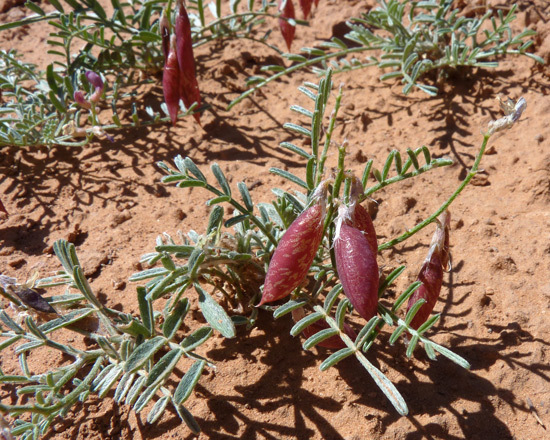 Click to read about the Astragalus genus. Semi-desert. Sand in openings, shrublands, woodlands. Spring summer. Pyramid Trail, Red Rock Park, Gallup, New Mexico, May 2, 2015. 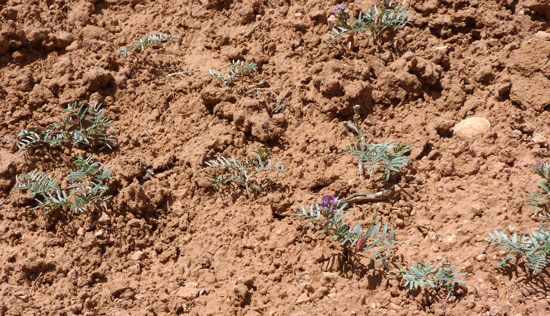 Astragalus ceramicus variety ceramicus has gray-green leaves with five-to-fifteen narrow leaflets. 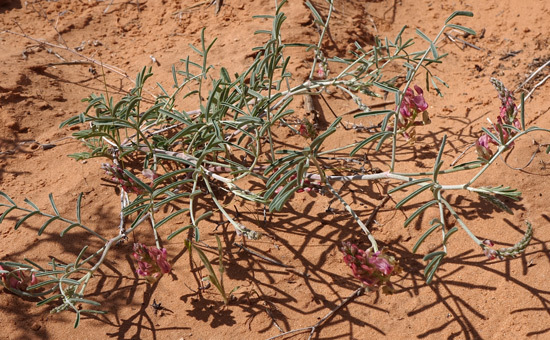 In our area it is most easily recognized by its usual size, only a few inches high, and by its characteristic habit of spreading over many square feet. It does the latter from an extensive underground system of roots which then sprout new plants -- as especially shown in the photograph at the top of this page. 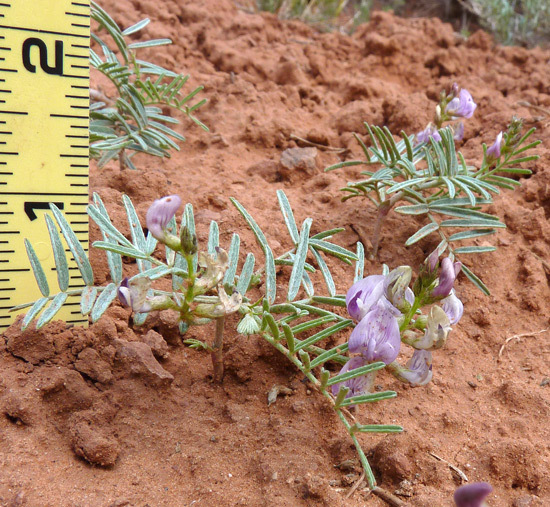 The smaller plants shown on this page seem to be the norm in southwest Colorado, but in southeast Utah plants are considerably larger, growing to over a foot tall and wide with leaves to 17 cm long as shown in the second photograph at left. 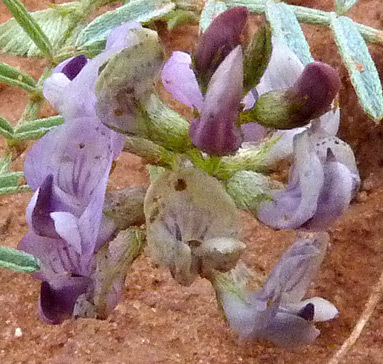 Frederick Pursh described this species in 1814 and named it Psoralea longifolia. 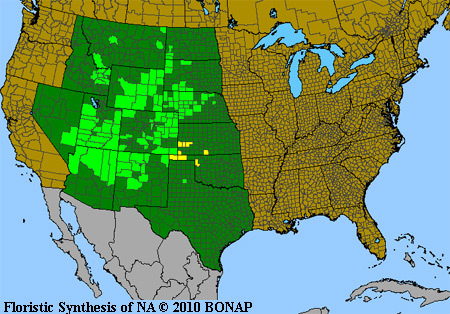 The first specimen was collected by John Bradbury in the "upper Louisiana" Territory in 1811. 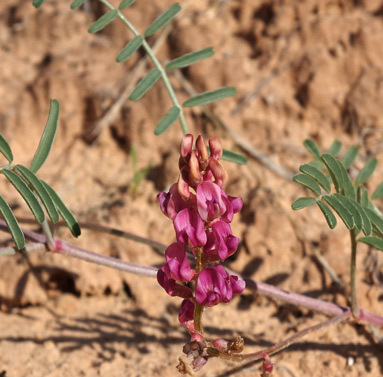 The plant has undergone numerous name changes: Orobus longifolius, Astragalus filifolius, Astragalus imperfectus variety ceramicus, Phaca picta, Astragalus picta, etc. 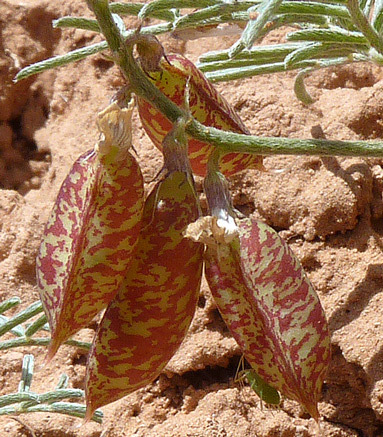 Eventually in 1894 Edmund Sheldon named it Astragalus ceramicus. Canyons of the Ancients National Monument, May 18, 2010 and May 24, 2013. 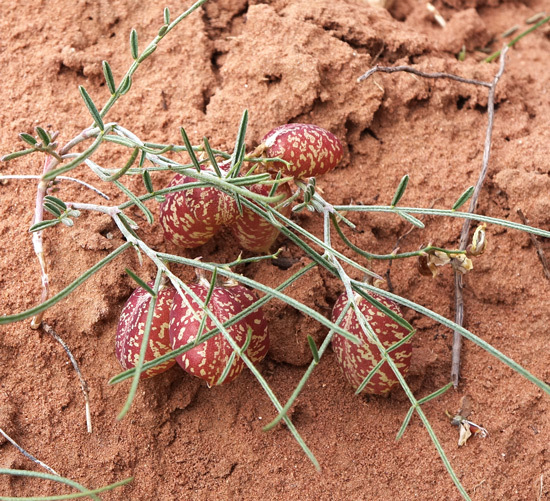 Pods are usually mottled red (although the may be all red), are inflated, papery, and pendant from usually upright stems. They change in shape and color as they develop. Canyons of the Ancients National Monument, May 18, 2010. 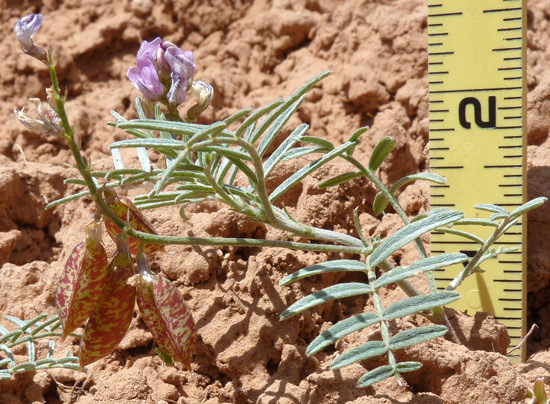 Leaves and stems of Astragalus ceramicus variety ceramicus are clothed in white malpighian hairs (also called "dolabriform" hairs), i.e., hairs which lie relatively flat against the plant surface but which are not attached at either end of the hair. Instead they are attached to the plant surface somewhere along the length of the hair (often toward the middle) by a very minute projection of the hair. The attachment near their center and the tapered points at both ends of the hair give the hairs the shape of a pick-axe head or the slightly upturned wings of a bird. While looking through a ten power hand lens at a plant part with malpighian hairs, push a pin against one end of a hair; both ends of the hairs will rotate in a circle because the hair swivels around its short, stubby attachment point. If you push against the end of a basifixed hair, only that end will rotate. 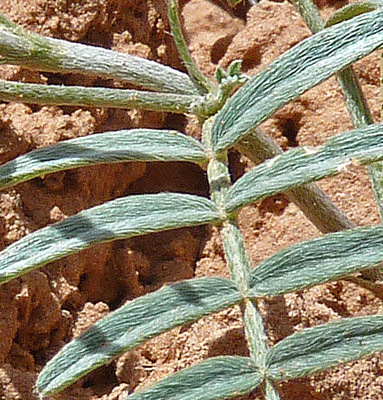 The malpighian hairs on Astragalus ceramicus variety ceramicus so densely cover the surface of the leaves and stem that the overall appearance of the plant is not green but sage gray. Butler Wash, Utah, April 19, 2015. Even the calyx surrounding the base of the flowers has the white malpighian hairs. Flowers are lovely, delicate shades of lavender and white to pink with stripes and sometimes dots. The final photograph shows the attractive, inflated pods. The rich, variegated colors give rise to the specific epithet, "ceramicus". John Torrey thought the pattern was quite ceramic-like.